Rewrote the printing innards for live preview windows, so that the printed output is closer to expectations. Fixed bug in which progress dialogs would leak memory. Fixed memory leak in the innards of the font system. Made changes to significantly improve performance when generating syntax-coloring information for extremely large files (SQL dumps being a good example of same). Fixed a performance bug when scrolling in text views with extremely long lines and the Line Numbers bar visible. Made a change to the Open File by Name search logic so that it doesn't search system headers and frameworks unless the search cache is backed by an Xcode project. Fixed bug in which data structures backing the Scripts menu (and other similar folder-backed menus) were not properly released when the menu was refreshed, leading to creeping memory use. Fixed a memory leak in SFTP process cleanup. Fixed crash which would occur occasionally (depending on the shape of memory) when trying to balance delimiters and the selection start was at the beginning of the document. Worked around bug on 10.8.x which broke running-browser detection (and thus the "Markup => Preview in => All Running Browsers" command). Worked around an elusive OS behavior in which the application would receive spurious change notifications for folders that it wasn't actually watching, which in turn triggered inappropriate refreshes of the Scripts, Text Filters, Stationery, and/or Clippings menus. Fixed crash which would happen when reloading ctags data in response to the tags files being changed on disk. Fixed crash which would occur when using "Save as Styled HTML" after using the expert preference to turn off inline CSS generation. Made further changes to the Dropbox check, since the on-disk format of ~/.dropbox/ has changed yet again. Now, the existence of that directory is enough to prove installation of Dropbox and trigger discovery of ~/Dropbox for application support content. Fixed likely cause of an occasional crash at startup. NB: In realtà non c'era bisogno che aggiornassi questo topic. Non è una edizione principale e Fragrua provvede ad aggiornarlo quando serve. L'ho fatto solo perché Text Wrangler non viene più supportato. Veramente un aggiornamento minore, trovato girovagando fra le notizie IT. Un aggiornamento minore, installato su High Sierra beta. 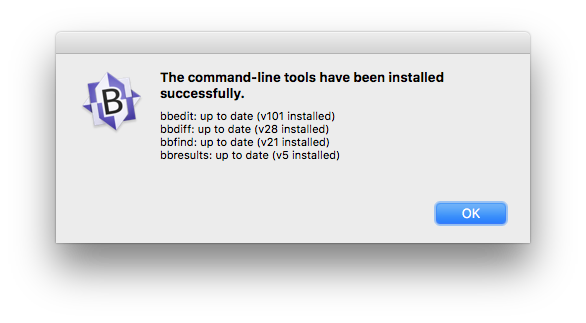 Improved dark-theme support - When using a dark color scheme, BBEdit now colors editing and project window chrome to match, for a more integrated overall appearance. (For customers used to the old behavior, this can be set in the "Appearance" preferences.) For customers who have never before used BBEdit or TextWrangler, the "BBEdit Dark" color scheme is now the factory default; this can be changed if desired in the "Text Colors" preferences. 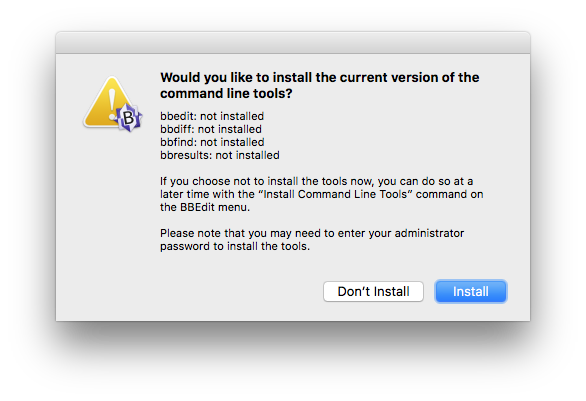 Improved platform behavior - Thanks to extensive internal overhaul, BBEdit now supports intrinsic OS behaviors such as Split View (and many others). Improved UI for FTP/SFTP Browsers, Text Factory, and Preview windows - many non-editing windows have been overhauled for improved appearance and behavior, and to add features. New "Canonize" tool - Provides a text-based model for batch search and replace, either within a single file or (by using a Text Factory) in multiple files. New "Columns" Editing Commands - Easily cut, copy, delete, or rearrange columns in delimited (CSV, TSV) text files without requiring a spreadsheet or complicated regular expressions. 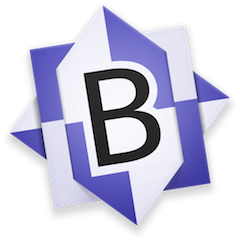 Text Extraction - This powerful addition to BBEdit's legendary searching capabilities allows you to locate and collect search results into a single text document. Extraction can be run on the active text document, or across multiple files and folders. Use of Grep replacement patterns during extraction enables transformations to the extracted text. Extensive Internal Modernization - Many internal subsystems have been rewritten or updated to support new features, improve performance, add refinement, and make future enhancements possible. 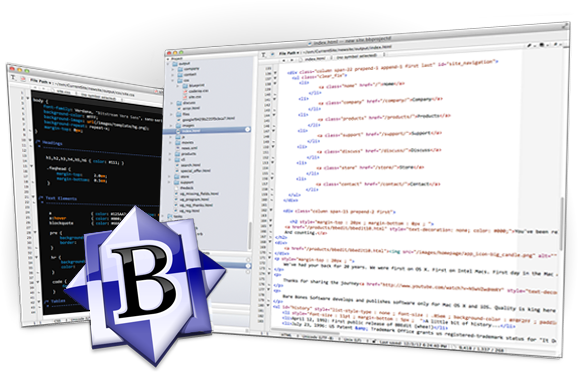 In all, BBEdit 12 contains over one hundred additions, changes, and refinements. The detailed change notes contain complete information on what is new and changed in this version. La versione 12 è stata accolta con molto favore nell'ambiente IT Mac. L'impressionante mole delle nuove funzioni ha entusiasmato gli utenti. È stata allargata anche la gamma di utilizzo. Andando ad occupare campi di applicazione di Excel e linguaggio Markdown. Tra gli altri cito questo, di un nostalgico appassionato. Contiene una grande quantità di aggiustamenti e risoluzioni di problemi e nessuna nuova caratteristica. Probabilmente il motivo principale è a causa di un chiusure improvvise verificate in MacOS 10.13 High Sierra. Migliora la stabilità nel determinare se una data posizione del file è all'interno di una copia di lavoro Git o Subversion.